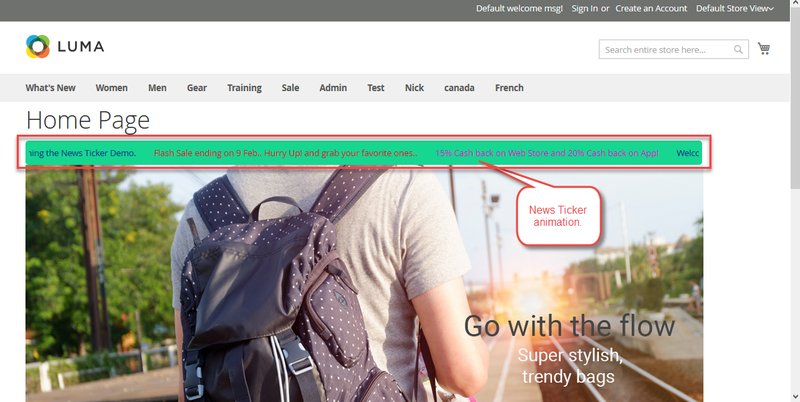 News Ticker is an amazing module which allows you to display moving text in your store. Display important news titles, recent updates or information about offers & discounts. The admin can create various news and then add news to the news ticker groups. Customizes the scrolling speed of the news ticker. You can even change the direction of the news ticker. The module has lots of customization options. Easily add the widget of the News Ticker. News ticker direction can be set to either left or right. 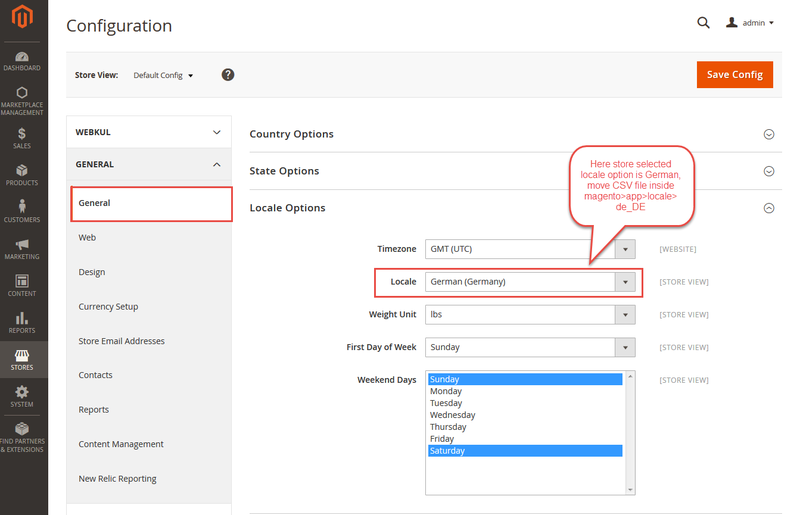 If the user wants to translate their module from English to German then they need to follow the path app/code/Webkul/NewsTicker/i18n in their unzipped Magento2 News Ticker folder and will get a CSV file with name “en_US.csv”. Now they will rename that CSV as “de_DE.csv” and translate all right side content after the comma in the German language. After editing the CSV, save it and then upload it to the path app/code/Webkul/NewsTicker/i18n where they have installed Magento2 on the server. The module will get translated into the German Language. It supports both RTL and LTR languages. After the installation of the module, the admin will see News Ticker menu. Inside News Ticker menu you will find – Manage News and Manage Groups menu options. After clicking the Manage News menu option, the admin can view, add, edit or delete the news. Add News – To create a news for the news ticker, click Add News button. Actions – Use this option to delete, enable or disable any news from the list. Filters – To find any specific news from the list, use this option. Edit – For editing or updating any news, click Edit. Now, on clicking on Add News, the news form opens as per screenshot. 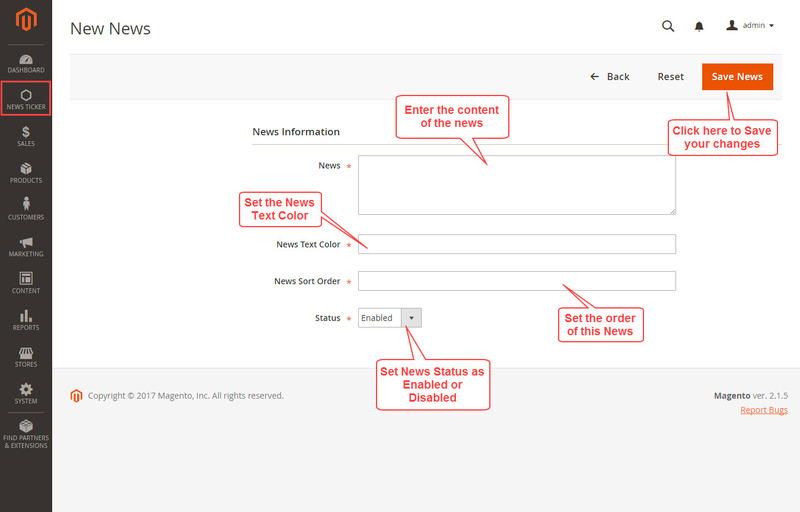 The admin can enter the news in the text box and can also enable the status of the news added. News – Enter the content of this news. Text Color – Set the text color for this news. Sort Order – Set the order of this news. Status – Set the status as Enabled to use this news, else select Disabled. Click Save News button to save your changes. After clicking the Manage Group option, following page will open. From here the admin can view all the news ticker groups. Information such as Group Title, Name, Code, Display Type, Speed, News IDs, and Status are visible. 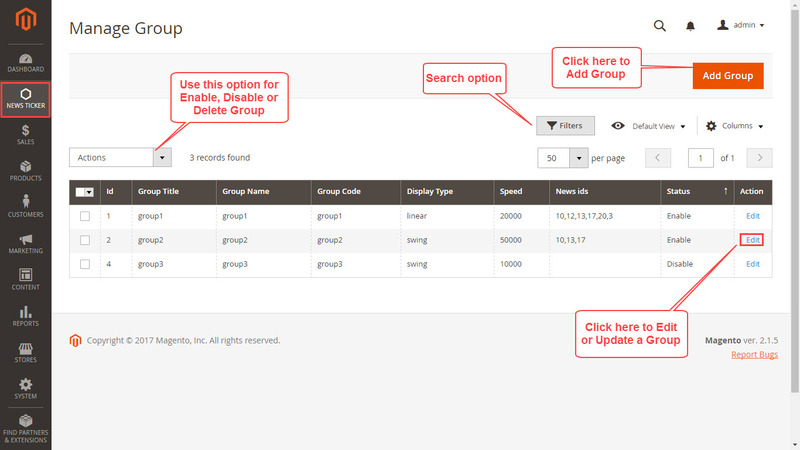 Add Group – To create a new group, click Add Group button. Actions – Use this option to Enable, Disable or Delete a group from the list. Filters – To find any group from the list, use this option. Edit – For updating an existing group, click Edit. To create a news ticker group, the admin needs to provide the following information. After providing the group information go to Group News and select the news from the list. Now the admin needs to select the news for the group. 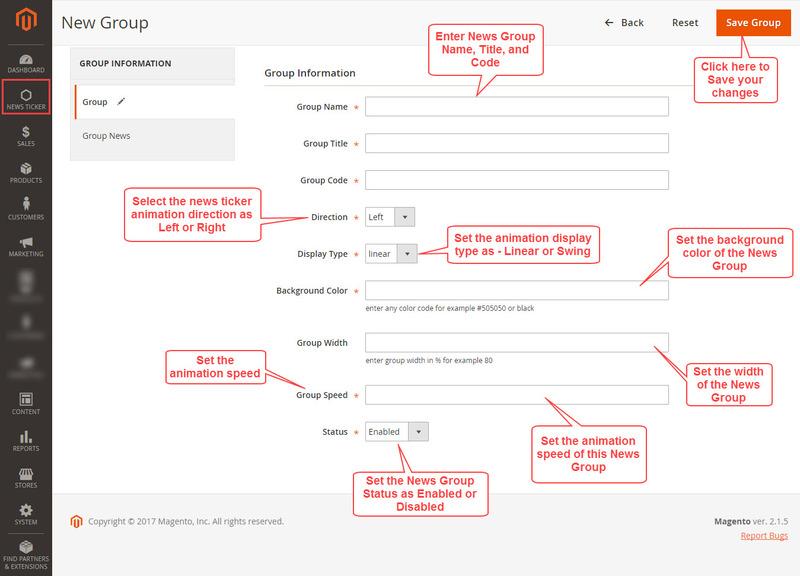 Use the checkbox to select the news items for the group. The selected news will be visible in the news ticker. Click Save Group button to apply your changes made. After you have added the group, you can customize the page you want to show the news ticker in. 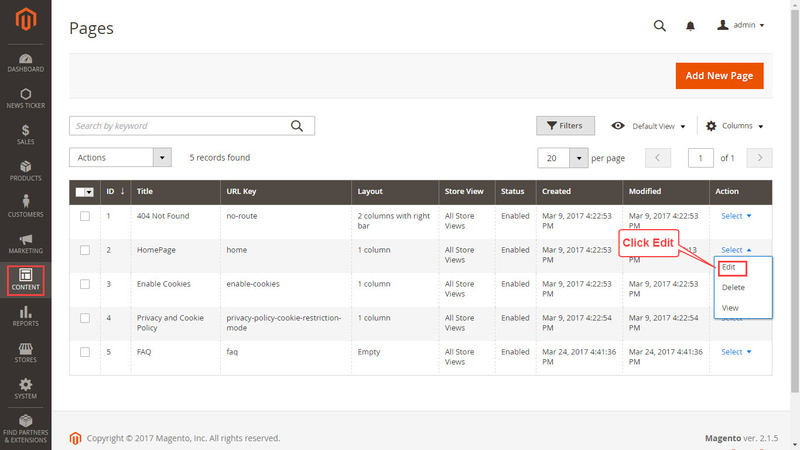 In Admin panel go to Content->pages and the list of pages will appear. From any page, admin can click on edit option to edit the content section for customizing the front page news ticker. Go to Content section and enter the news ticker block code as appears in the screenshot below. This is a sample code for a news ticker. 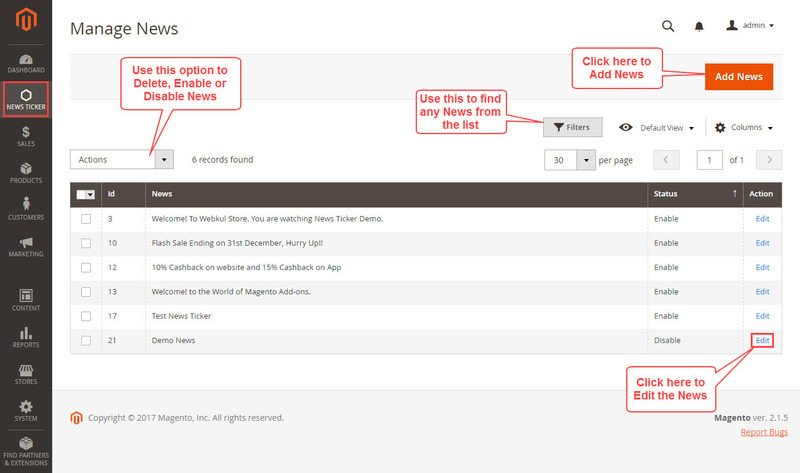 To add a news ticker widget the admin will navigate to Content>Pages. Here, add a new page or use an existing one to add the news ticker. Now, to add the news ticker click Add New Page button on the top right-hand corner or use an already created page. This brings up the section to add a new page. Here, enter the Page Title and then go to the Content section. 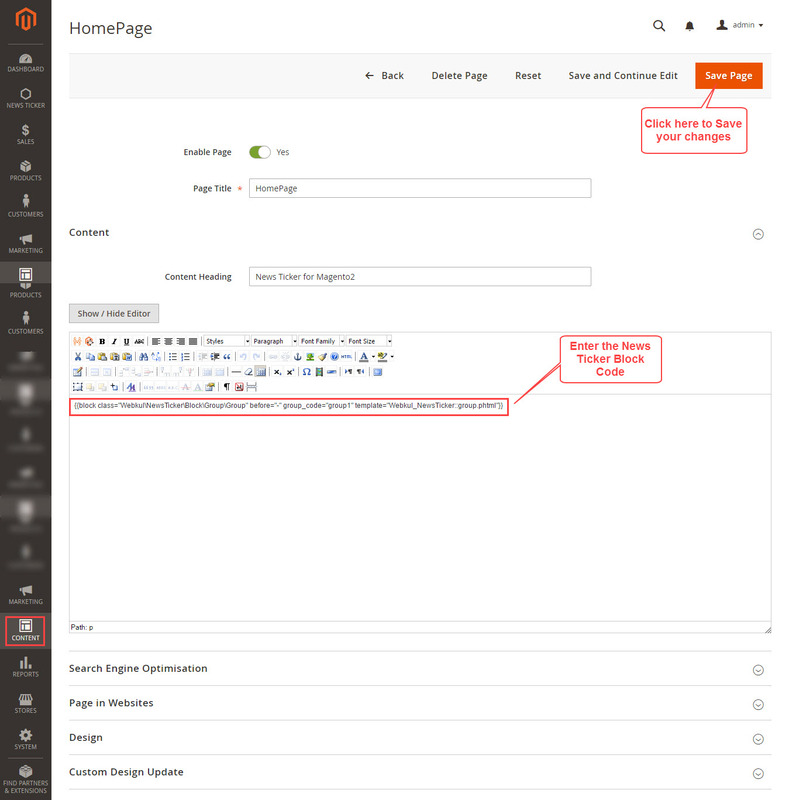 Enter the content heading and within the editor click the add widget button. Clicking the widget brings up the section to add the widget. For the Widget Type select the News Ticker widget from the drop-down option. 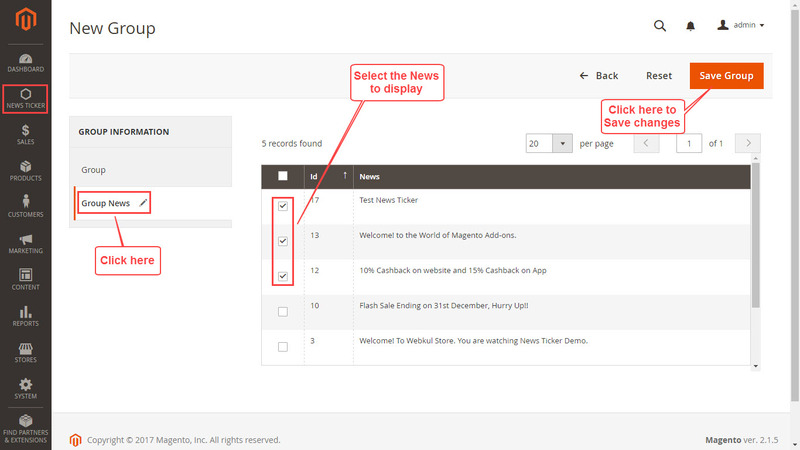 For the Widget Options select the News Group that you want to display at the front-end. Now, click the Insert Widget button. After inserting the widget, click the Save button at the top-right hand side and you are done configuring the News Ticker at your required page. Here is the sample News Ticker appearing on the homepage. The background color has been set to light greenish color. Also, different text colors have been set for the multiple group news items.